Welcome to Adventure House. Just to look at our first page…you’d be surprised that it holds over 5000 items available for sale. To help navigate our site, we’ve produced this informational page to help you guide your way through to find what you are looking for. Here is the top of the page, we’ve included the numbers as guides to give you information regarding each function. Number 1 – This is the logo, and if you click it at any time it will return you to this main page, regardless of where you are in the site. Number 2 – Search Products Box. From here you can enter a multitude of search topics. Close up of the Search Box below. Type what you are looking for here. You could enter the date the publication was produced, or even a current date like: 10/16 to see all new publications published on that date that we carry. You could also simply enter the publication name. Please be advised that the system will return a list of everything with that title. As the sample above is ARGOSY, it will return the results including ARGOSY ALL-STORY WEEKLY, THE ARGOSY, ARGOSY WEEKLY, as well as any books that include the name ARGOSY within their description. Number 3 – Main Menu. These are clickable links. If you want to see what is coming up in the next few months, simply click on Coming Soon. Need to know more about our auctions? Click on GO TO AUCTION. Same goes for our pulp art site, ADVENTURE HOUSE ART. 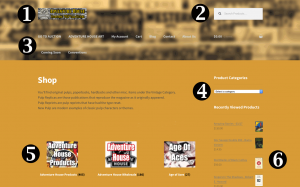 Number 4 – Product Categories – A quick way to browse through all the locations we display our products. If you are looking for a specific title, or publication, this drop-down menu makes it quick and easy. Remember, we have thousands of items, and our catalog is extensive, so there is a lot to go through. Number 5 – General Category Links. Each box is a link that will transport you to specific titles or genres. 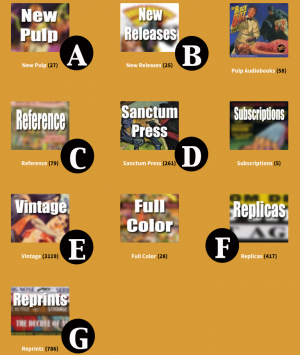 A – is the New Pulp, which includes all those books published by new authors using the vintage characters from the past. These are all new stories, and you’ll find some real treats here. B – is the most recent books/products that have been released in the past several months. The newest items are listed first. 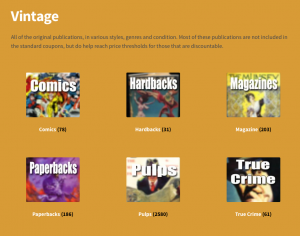 C – includes both new and old reference books, or material written about the pulps. Generally all non-fiction. D – all major publishers have their own link. Which includes Adventure House, Black Dog Books, Age of Aces Press, Sanctum Books and more. F – Replicas include all those new publications that reproduce the pulp as it originally appeared. This would include both the hand-made material, as well as those mass-produced replicas that we publish. G – Reprints are those publications that have re-set the type from the original publications. In most cases they are anthologies, or books that have combined several stories into a single publication. Pretty self explanatory. Click on any of the links to take you to another menu to help you find what you are looking for. 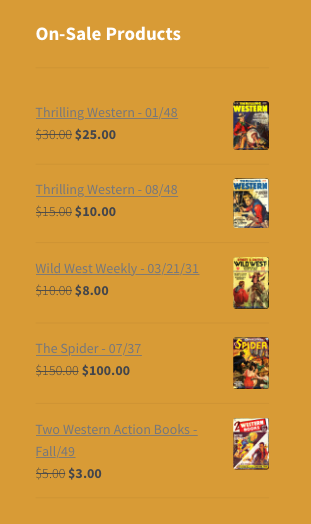 Comics – we’ve just begun to list thousands of Gold, Silver and Bronze age books. Hardbacks – just scratching the surface, each book is listed simply in order by publication date, with the newest books listed first. 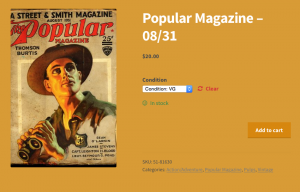 Magazines – glossy magazines, or even old pulp sized mags…each listed by date. Paperbacks – currently we have only listed those paperbacks that relate to the pulps. Once you go to the paperback section, books are divided up by character. True Crime – all of those magazines that published…cough…cough…”true” crime stories. 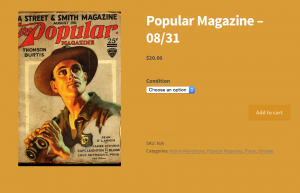 Sample Transaction – Let’s say you choose PULPS from the above menu. When you clicked on the linked image, it will take you to the following page. Choose A Genre – click on the linked image based on the genre. In our sample, we’ve chosen Action/Adventure. 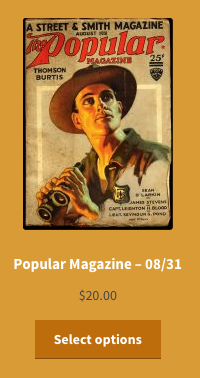 Choose a Magazine Title – click on the image of the title you have interest in. In our case we’ve used POPULAR MAGAZINE. 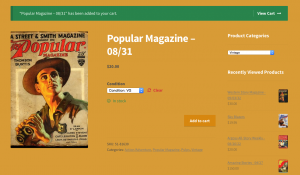 Choose A Magazine – the list is sorted by newest date first…but you can click on the drop-down menu and choose by price to sort by highest to lowest or vice-a-versa. Or you can click along the number line to move within the possible hundreds of copies available. In our case we’ve decided we want to 08/31 issue. You can click on either the image, or the Select options box. Once you click on the item, you’ll find more information of the particular book. Click on the Condition option. Here if there are multiple copies in different conditions, you can choose which you’d prefer. In this case there is only a single VG copy. Click on the VG option. Once selected, the price will be displayed. If the item is in stock, it will show with our little smiley face. If you want that particular book, click on the Add to cart button. 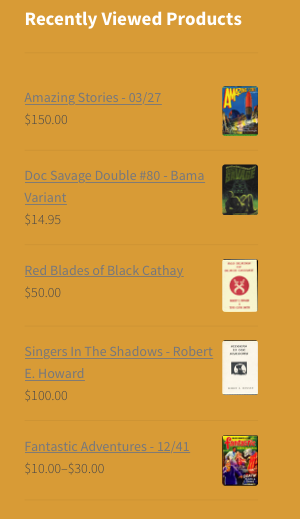 The book has been added to the cart, displayed with the green banner at the top. If you want to add more items, you can simply click on any of the “bread crumb” links that you’ll find below the SKU number. 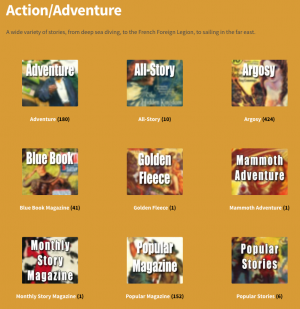 You can click on the Popular Magazine link to remain within the Popular’s, or perhaps you want to check out more titles within the Action/Adventure category. Let’s say we simply want the one item. You can then click on the View Cart button. Here is what the cart will look like. It shows all the items you’ve chosen, and a box to include any discount/coupons that are available. Please be advised that you are allowed to take a discount on any of the new products that we offer. Spend $20 or more and you can then enter the number 10 in the coupon code box and hit Apply Coupon. Spend $100 or more and you can then enter the number 15 into the coupon code box for your discount. Be aware that during special sales, we will offer discounts on vintage material, either through automatic discounts, or coupon codes. 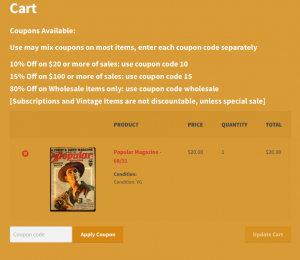 You can combine codes, to receive discounts on all applicable items. Therefore if you bought items from our wholesale section, as well as our new items, if you enter the codes “wholesale” and “10” or “15”, one at a time, it will give you the proper discounts on those items that have discounts available. 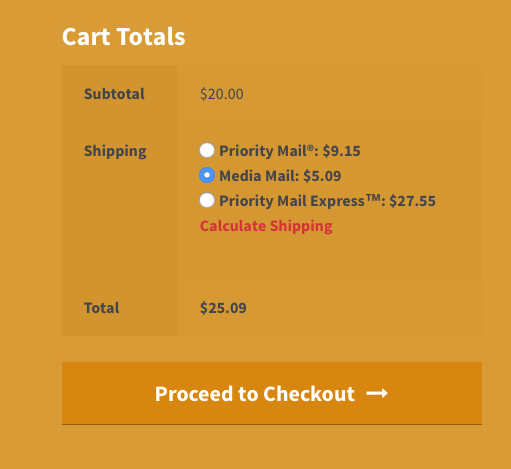 Once you’ve entered your name and address, the cart will offer you the shipping options. Prices are direct from the USPS website, based on size and weight. Once you click on the Proceed to Checkout box, it will allow you to pay by either sending us a check, or if you’d like to pay by credit card, will allow you to choose Paypal. The image below shows what is known as a Tag Cloud. We’ve included information on most items, in the form of a “tag.” If you click on any of the links below, will then populate the screen with those items with the similar tag. All those items that you’ve looked at recently. The site will place a “cookie”…a simple file on your computer that will keep track of what you look at. Please be aware, that we do not access, or collect any of that data…it’s simply for your use. A menu displaying a small number of items we’ve specially priced for quick sale. You can order any of them, by simply clicking on the title, or the image.